We’re excited to announce our fifth annual list of Top 10 FlatFee Registered Trademarks 2016. 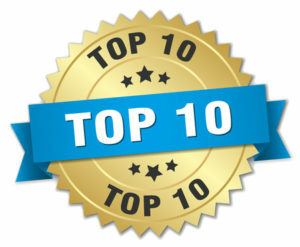 It’s hard to believe it has been 5 YEARS since we started compiling our Top 10 Registered Marks list. What started as a simple idea to feature our clients has now become the signature start of our monthly newsletter each year and a great way to recognize our clients’ work. We had so many excellent brands registered this year, it was hard to narrow it down to just 10! Thank you to all of our valued clients, friends and supporters who nominated brands for our annual Top 10 list. In 2016, the U.S. Patent and Trademark Office issued 232,329 new trademark registrations. In comparision, the USPTO issued 213,732 registrations in 2015. The number of registrations issued has steadily increased over the last several years, showing us that more and more companies understand the importance of trademark registration and brand protection! Our top trademarks are selected based on a number of factors, including: trademark distinctiveness, unique brand identity/design, actual use and recognition in the marketplace, and entertainment value. This year’s list highlights our best picks in the fields of art, food and beverage, wellness and self-improvement. Congratulations to the 2016 Top FlatFee Trademark winners and all of our clients who filed and registered trademarks last year! We look forward to seeing your businesses’ continued growth and success. We compile the Top 10 FlatFee Registered Trademarks list annually, so be sure to get your trademark applications submitted so they can be considered once registered. For more information on the Annual Top 10 FlatFee Registered Trademarks or for assistance registering your trademark or brand name, please call for a complimentary consultation with one of our trademark attorneys, (800) 769-7790. We’re always happy to hear from you!